In this new take on the classic love story, Bradley Cooper plays seasoned musician Jackson Maine, who discovers — and falls in love with — struggling artist Ally (Lady Gaga). She has just about given up on her dream to make it big as a singer, until Jackson coaxes her out into the spotlight. Even as Ally's career takes off, the personal side of their relationship is breaking down, as Jack fights an ongoing battle with his own internal demons. A large part of A Star is Born’s success is the very naturalistic feel that Cooper and company are able to create both visually and narratively. Cooper’s choices as a director immerse you into the rockstar lifestyle with surprising bravado, and at it’s most effective, it makes you forget you’re even watching a film. The decision to always shoot subjectively from the stage — never from the audience perspective — makes you feel as though you’re right there and fills you with the exhilaration of playing in front of a large crowd. If the performances feel very authentic and raw, it’s because there’s no false aspect to them; they were performed live in front of real festival crowds. This was an incredibly bold, high stakes move because it meant that there would only be one opportunity to capture the scene, but cinematographer Matthew Libatique (most known for his work with Darren Aronofsky) makes it seem effortless and captures some truly magical moments on stage. 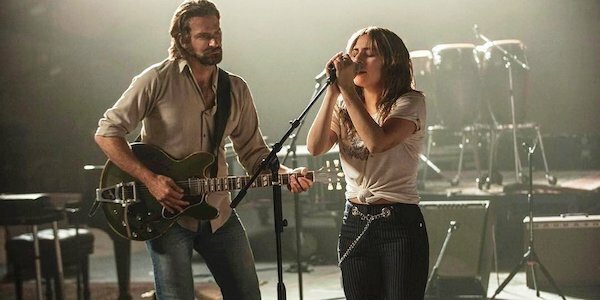 Narratively speaking, the 2018 version is virtually the same as the ‘76 Streisand/Kristofferson iteration — which, thanks to screenwriters John Gregory Dunne and Joan Didion, famously brought the Star is Born story out of Hollywood and into the rock area — but updated slightly to be more inclusive and modern. It’s still a tale of two trajectories — one of a descending star, while the other is on an ascension — that intersect, entangle, and befall tragedy, and it’s still very much about fame and its fallout. What sets this version apart from its many predecessors, though, is how veritable the characters and their chemistry feel, and Cooper smartly pulls from his personal experience (as well as Lady Gaga’s) to create something closer the chest, which elevates the project above just another shallow remake. It’s less about the obsession with being famous and more about having something to say through art, with a heavy emphasis on the internal pressures that boil up when you lose that ability. This sentiment is summed up in a meta line of dialogue delivered by Sam Elliot, who plays Cooper’s brother in the film: “Music is essentially 12 notes between any octave. 12 notes and the octave repeats. It’s the same story, told over and over. All any artist can offer the world is how they see those 12 notes.” And Cooper interprets these notes like a true artist and evokes a visceral love story that packs an emotional wallop. The film hinges on the characters and their relationships, and it delivers a slew of fantastic performances. Cooper shines as a very convincing grizzled rockstar with surprisingly impressive pipes, but Lady Gaga soars as Ally. Even though she’s playing a part that’s very near to her own experience, she makes it feel effortless and fills the film with a wonderful presence. Elevating the two lead performances are Sam Elliot, Dave Chappelle and Andrew Dice Clay, who all give solid support in their own right and give depth and definition to the film. You probably never asked for a 4th version of A Star is Born, but you won’t be disappointed with what you get. The film flies by, and it successfully wraps you up in the story — even if you know exactly where its headed — through its performances, cinematography and music. The latter plays an integral role in the film and some of the tunes are actually quite good — fair warning: you may have “Shallow” stuck in your head for a few days (if you’re not humming it already). Bradley Cooper and Lady Gaga both prove that they have talents that exceed their established careers, and it will be very exciting to see what they do next. Rating: 4 noses outta 5. What did you think? Did the film sweep you away? Were you delighted by Lady Gaga’s performance? We want to know. Share your thoughts and feelings in the comments section below, and as always, remember to viddy well!